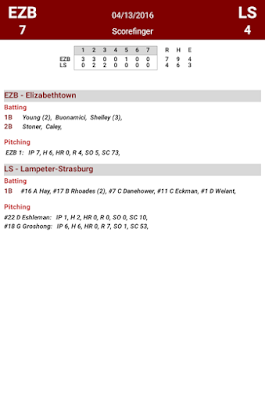 After the top of the second inning, Lampeter-Strasburg outscored Elizabethtown 4-1. Before that, however, the Bears jumped out to a 6-0 advantage aided by five wild pitches and two errors. Garrett Groshong took the hill for the Pioneers (now 4-3) to start the game, and took 31 pitches to get through the first inning and another 19 to get through the second. Typically, Groshong is a control pitcher who hits spots and forces the opponent to put the ball in play; during the first two innings, though, he struggled mightily and threw five wild pitches, two of which brought home runs for the patient, scrappy Bears lineup. In the bottom of the second, the Pioneers' bats showed signs of life with two outs. Andrew Hay worked a tough at-bat and earned a walk, promptly stole second base, moved to third on an errant pickoff throw, and scored when Elizabethtown's second baseman bobbled a routine grounder that could have ended the inning. Dan Eshleman also scored when Connor Brown launched a single to left, but when Brown was caught trying to advance to second, the rally drew to a close. Groshong settled in, though, and made quick work of the third through sixth innings during which he allowed just one run (his only earned run of the outing), which scored on a double play ball. Overall, Groshong averaged only seven pitches per inning during the final four frames he threw, and the Pioneers had an opportunity to battle back at the plate. They added two more runs in the third inning, but left men aboard. That was their last sign of life offensively. Over the remainder of the game, they notched just two hits and five total baserunners, none of whom scored, ending the game with a 7-4 victory for Elizabethtown, whose record now stands at 5-3. Senior outfielder Andrew Hay was disappointed by the team's play, but does not see a cause for alarm despite the team's underwhelming start. "We have yet to put together a complete game where we dominate every aspect of the game," he says. "Once we get back to playing our game and get back to winning the little things, we'll be just fine. We're a family, and we've got to pull together to find ways to win." 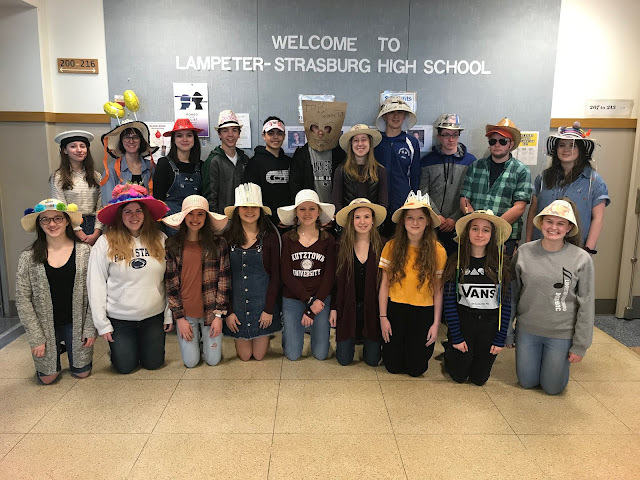 It will be a quick turnaround for the Pioneers, who head to Solanco tomorrow afternoon to play a rescheduled game against another middling section two foe. The game will be an opportunity for younger players to step up, as three normal starters for L-S will miss the game for varying reasons. "The younger guys have to step up and fill some empty roles," says Hay, who will miss the rescheduled game due to a previously scheduled college visit. "They've worked just as hard as the rest of us and now we need them in a big way. I have full faith and confidence in my teammates. We've got to be sharp!"